“If you can’t understand it without an explanation, you can’t understand it with an explanation” says one of the characters in Haruki Murakami’s 1Q84, and to an extent this highlights the dilemma of any reviewer of this book. Murakami is now one of the world’s leading authors, with a legion of passionate fans in almost every country. At the same time, many readers find his books puzzling and simply cannot understand the attraction of his fiction. 1Q84 is a great novel, but I wouldn’t recommend it as the starting point for anyone who wants to explore his writing. In fact, 1Q84 is three books, and in the UK has been published in two parts with separate translators (books 1/2 and book 3). Not surprisingly, then, it will take a while for most readers to complete. The title is a play on the Japanese pronunciation of the year 1984, and a reference to George Orwell’s Nineteen Eighty-Four. The first two books consist of two main narratives told in alternative chapters, each following one of the main characters, Aomame and Tengo. The overall plot of the books is a simple one — the story of their search for each other, and whether their mutual love and sense of destiny will be strong enough to overcome all of the obstacles between them. This is built on the premise of one of Murakami’s most popular short stories – On seeing the 100% Perfect Girl one Beautiful April Morning. Book 3 alternates their stories with those of a third character, Ushikawa, in many ways the saddest part of the novel. 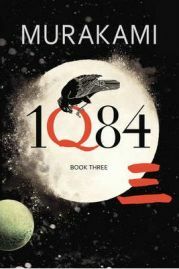 1Q84 encompasses many of the common themes and symbols which characterise Murakami’s work. Aomame starts the novel by descending a mysterious set of stairs into an alternative world. Typically, it takes a while to realise what has happened – the world of 1Q84 is very similar to the real world — but gradually and unexpectedly more surreal/fantastic elements are introduced, some of which are opaque and their significance unexplained. Musical and other cultural allusions are scattered throughout, there is a strange sect, cats are important and there are repeated references to ears and dreams. Above all, the moon assumes a prominent role – the defining characteristic of 1Q84 is the presence of two moons, a normal moon and a smaller and darker one which can be seen only by a few people. It is much more sexually explicit that most of his previous work, which has troubled some reviewers, but perhaps this reflects changing Japanese culture rather than anything else. There is no doubt that Murakami’s fiction has a serious underlying purpose and intent, albeit one that he is reluctant to explain. There are some clues in 1Q84 – a key passage about Carl Jung seems important – Jung considered individuation (the psychological process of integrating the opposites including the conscious with the unconscious while still maintaining their relative autonomy) necessary for a person to become whole, and Murkami’s fiction is full of symbols of this process. There is a lot more which could be said about this, but any appreciation of it is unnecessary to enjoying the book. Ultimately, 1Q84 is a simple love story. In Murakami’s novels it is rarely clear if the boy will find the girl. Sometimes despite the barriers love triumphs. But more often the 100% perfect boy and girl pass each other in the street and don’t stop, or like satellites orbiting in opposite directions come together briefly before parting forever – much like life, some would say. There is something about his fiction with which may readers (including me) identify – these readers will greet 1Q84 as a triumph. But if you want to start on Murakami for the first time, I would suggest Norwegian Wood (his breakthrough book) or Kafka’s Shore as a starting point. Save 1Q84 until you are hooked and you will probably enjoy it even more. I also focused on the love story as the main theme in the book. My first Murakami was also his best, in my opinion, so far – After Dark, a relatively short novel.